One of the scariest times of young personâ€™s life is when moving out of their parents’ home for the first time. It can be even more intimidating than going off to live at college, if only because at that time youâ€™re still under your parents’ wing . . . financially speaking. When you move out of your parents’ home for the first time, it has an air of permanence about it. And not only that, itâ€™s sink or swim time â€“ either you will be able to make it on your own, or risk moving back home with your tail between your legs. But it doesnâ€™t have to be that way. Some advance preparation can not only make the transition from your parents’ home to your own home easier, but can also give you a better life as time goes on. 1. Keep your debt to a minimum. This can be problematic if you are a recent college graduate and already have a substantial amount of student loan debt. If you do, it might be worth spending a couple of years remaining at home while throwing all of your financial resources at paying off, or at least paying down the debt. Generally speaking, your chances of making it on your own will also be better if you donâ€™t have a car loan. But if you already have one, it might be best delaying your departure to pay it off. Otherwise consider buying a used car that you can afford by paying cash. It should also go without saying that any credit cards you have should have zero balances before you leave. If you canâ€™t make that happen while youâ€™re still living home, your balances will probably only get bigger when youâ€™re out on your own. Thereâ€™s one more point about debt and now is the perfect time to bring it up: Debt tends to be a bad habit. If you donâ€™t lick the problem early on, it could very well haunt you all of your life. If you are still living home, then now is the best time to get that under control once and for all. 2. Make sure you have some savings. It will be far easier to avoid going into debt when living on your own if you start out with a decent amount of savings. The word â€œcushionâ€ is often associated with savings, as in a savings cushion, and thereâ€™s good reason for this connection. A cushion is something thatâ€™s soft and comfortable â€“ which is exactly what savings are when financial difficulties hit. And just like debt, savings are also a habit. Have you ever noticed that some people seem to be natural savers, while others never seem to get the hang of it? Chances are, the reason for both situations developed early in life. Those who were savers at the beginning, continued to be as they got older and even amassed more savings. And the non-savers? They were usually stuck running in place where finances are concerned. This is an important time in your life to choose which side of that line you want to be on. Once again, it is much easier to save money while you are living home than it will be once youâ€™re out on your own. Seize the day, right? 3. Rent a room or share a rental. If you really want to increase your chances of succeeding at your first try in living on your own, you should try doing it on the cheap â€“ at least at the very beginning. 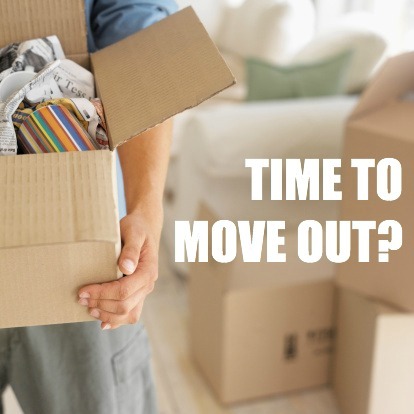 By renting a room or sharing a rental apartment, youâ€™ll cut the cost of living on your own substantially and improve your chances of making it the first time out. If you share an apartment with at least one other person, you can cut these upfront expenses in half, freeing up more money to pay off debt or to keep in savings. If you rent a room, you wonâ€™t even have some of these expenses. Itâ€™s just a way to get started until youâ€™re on a firm financial footing. As a general rule, you should keep your monthly rent to no more than 25% of your gross income (or better yet, 25% of your net income). That will ensure that you do not risk being â€œhouse poorâ€ â€“ that unfortunate state of affairs in which a disproportionate amount of your income is dedicated to housing. This will leave you very little for extras like having fun, paying off debt, or saving money. The time to avoid this trap is when youâ€™re first starting out. 4. Buy what you need second hand. We already discussed how buying a secondhand car can free you from having a loan attached to it. But you can follow the same pattern with everything that you buy. You can usually buy furniture and entertainment equipment at a fraction of retail cost by buying them at thrift stores, secondhand stores, garage sales, and estate sales. Yes, it will take some time to accumulate the things that you need, but you can save 70%, 80%, or even 90% of what it will cost to buy the same items in retail stores brand-new. That will be money that you can use for better purposes. As the years go by, you can gradually replace what was bought secondhand with newer items. That will make it a lot easier for you to budget, and to avoid credit crunches and draining your savings. If youâ€™ve been living on your own, what advice would you give to someone who is about to make the jump?